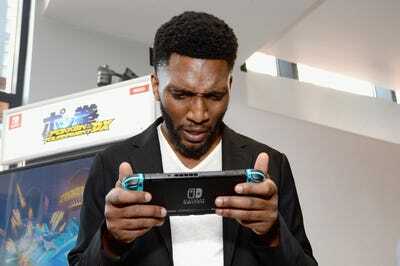 Michael Kovac/Getty Images for NintendoActor Yusuf Gatewood from the CW series ‘The Originals’ stopped by Nintendo at the TV Insider Lounge to check out Nintendo Switch during Comic-Con International at Hard Rock Hotel San Diego on July 22, 2017 in San Diego, California. First-party Nintendo titles give the Japanese video-game maker a key advantage over its global competitors such as PlayStation 4 and Xbox One. Switch demand is going to be heavily skewed towards the October to December holiday season. Morgan Stanley argued that Switch sales will lift Nintendo’s share price from a longer cycle. Watch Nintendo trade in real-time here. Switch sales are going to surge as Nintendo rolls out its new Pocket Monsters Smash Brothers games ahead of the the holiday season, according to Morgan Stanley. These first-party titles that are solely for Nintendo consoles give the Japanese game maker a key advantage – a strong pricing power – over its global competitors such as PlayStation4 and Xbox One, and will help lift Nintendo shares over the long term, Morgan Stanley analysts Masahiro Ono and Yui Yasumoto wrote in a note sent out to clients on Monday. “Margins on 1st party software are high, as these margins are driven up further by digital downloads, we think the validity of valuation comparisons with powerful US publishers is stronger in the case of Nintendo than for a con- sole maker such as Sony,” said the two analysts from Morgan Stanley. They view the recent ¥37,232 share price as a near-term bottom and say shares could hit ¥51,000 – 38% above where shares were trading Tuesday. Ono and Yasumoto stated that the Switch has a longer life cycle than the company’s Wii generation but will match Wii’s peak annual sales, because they see an effective “one person, one console” penetration strategy that brings 3DS user migration to Switch and Switch Online’s popularity among younger users. “The strategy for Switch is radically different from that of the Wii generation – which was sold bundled with Will Sports in Europe and the US, and tapped demand from adult users – making it tough to appeal to child users with a console price tag of $US300 in the off season, and we expected Switch demand to be particularly heavily skewed towards the Oct-Dec holiday season,” they said, reiterating that the current sluggishness in Switch sell-throughs won’t have an extensive impact on Nintendo’s share price. Atul Goyal at Jefferies, who has a ¥65,100 price target, believes shares could soar 80% even if Switch sales are flat. Goyal says Nintendo is the “cheapest game stock” in his coverage and that the company’s operating profit could triple in three years. 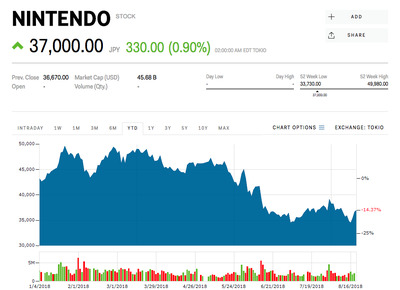 Nintendo shares were down 14% this year through Monday.